The Festival focuses on the abundance and diversity of the natural world around us – from the Atlantic Ocean westward through the Indian River Lagoon estuary system to the St. Johns River and surrounding wetlands. Educational emphasis is placed on the preservation and management of animals and their habitats, as well as the cultural heritage and historical venues to be found in East Central Florida. The Festival features bird and wildlife watching opportunities, nature and technology tours, boat and kayaking trips, field trips, seminars, workshops, photography sessions and evening keynote presentations. The Brevard Nature Alliance has done a wonderful job of organizing a birders heaven in Titusville, Florida. The 2009 Space Coast Birding and Wildlife Festival has been a ton of fun for me. It started on Wednesday and I gave 2 seminars on Purple Martins. The festival has assembled a prestigious group of nationally and internationally recognized scientists, biologists, photographers, ornithologists and naturalists. I especially loved Jonathan Woods presentation of the Raptor Project as I was fortunate to have my booth be located DIRECTLY in front of the stage. So basically for 8 hours of the day I was within 10 feet of about a dozen raptors, including an American Bald Eagle, Golden Eagle, Barn Owl and other assorted Owls, Falcons, Hawks, Kestrel, and even a raven! Flying over head WITHIN the exhibit area several times a day. I was very impressed with the art show that was located right next to me. The quality of the art was phenomenal. I met some great people with the Enchanted Forest, the Merrit Island National Wildlife Refuge and more. It really has been a great 3 days. Tomorrow is the last day and I will again be there preaching “purple” at my booth. I hope to see you there and I hope to join them again next year! I should have known better than to trust a weather forecast. I dated a meteorologist many years ago. Not to say anything negative about him, but if he knew what an in-exact science forecasting the weather was, I should know by now. The cold snap of this weekend was a frigid mid seventy degrees. The weather was beautiful and picture postcard perfect. Today may have reached the low 80′s. So much for putting out crickets. No need to bother. This morning I may have had a new female going in and out of compartments. I WILL stay out tonight and do a good head count. I promise! The Live streaming webcam/birdcam (whatever you want to call it) is proving addicting. I hope you all are enjoying it. I am still trying to get the stream on an “impartial/non-commercial” broadcast website without luck. I was told yesterday that I need to get a static IP address as my IP address is “dynamic” In regular language it means put out more money. Which brings me to a short statement I want to make. For anyone that thinks that my motives on my websites are dollar driven. You can not be any further from the truth. When you add up all the upfront and operational costs of designing and making a website, you would see that it will be a long time before I can retire! Without going into my finances, I just want any nay-sayers to know that having just the name of the site (ie:MyPurpleMartinBlog.com and PurpleMartins-R-Us.com) costs money. You pay per year of having the name. Then you pay someone for “hosting” the site (computer space to store all the sites information) Then the charges for someone to make it look like it does, work like it does, inventory, time, search engine/Google results…the list goes on and on. Enough said! Oh, My sweet darling of a husband, put up a small Bat House for me. He was not thrilled, but he did it with a smile and with his usual willingness to please. I can tell he is not over-joyed with the thought of Bats living on the chimney but his love for me is stronger than his disgust of Bat guano, I suppose. I am a lucky girl! The early arrival of 3 Purple Martins had me thinking that this season was ready to get underway. The cool weather and quiet attitude of my 3(?) Martins has me now thinking otherwise. I even began to doubt if the birds were here or not. Had they only been staying a night or two to gather strength before continuing on? I would look up constantly without catching sight of any Purple Martins anywhere. So last night I sat outside and waited and waited and waited. Finally, so high that the martins appeared as specks, I saw 2 of them. Eating feverishly in the last moments of daylight. Pickings must be slim with the combination of cool weather and winds which are getting stronger today. When they could wait no longer they dove into what will be gourd #5. The male only pausing at the entrance long enough to allow his mate entrance. A brief and quiet call and he shuffled in. So, that’s the story. Early arrivers face challenges no matter the latitude. The task of foraging is keeping them busy all day and the weather is supposed to get even cooler and more windy. I doubt I will see much of the martins while the cool snap is hanging around. I stood there and stared at the gourd rack. I noticed something else. The third female peeking out of what will be gourd #3. Sneeky, sneeky, sneeky! The winds are from the North now at about 10mph, gusting to 15. Showers are expected. It will be Cold all weekend. I know, I know…South Florida. We don’t know what cold is! I will put out dried mealworms and crickets in the feeder. Supplemental feeding is not common in Florida. So the chances of them actually eating them are slim. But I will put them out and my conscience will be clean and clear. The webcam is working great and I am waiting on another camera to hook up what will be a nest cam. I am VERY pleased with the clarity of the picture so far. It a Lorex product and the tech support is very fast and efficient. I highly recommend the camera. Some people talk about their Purple Martins and area able to tell you certain personality quirks or details that distinguishes one bird from another. I have no such special gift. I can only look at my birds and tell you if it is a male or female Purple Martin and if it is an adult(ASY) or subadult(SY). So today along with my pair, that I have NO CLUE as to which gourd they are staying in, there is an extra female. I was told by Annie in Wisconsin (Thanks Annie!!!) what gourd it may be which reminded me that I desperately need to number my gourds. Thank goodness for my fellow Purple Martin Conservation Association “forumites”! Which reminds me. I wanted to mention to any New Purple Martin enthusiasts that the Purple Martin Conservation Association has an active forum to help those new in the hobby. They are a not for profit organization and a portion of the money they make goes directly to Purple Martin research. They are most worthy of your support. 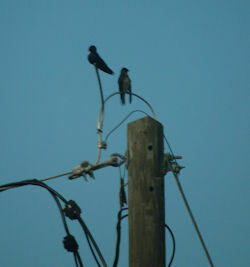 Check out their website, www.purplemartin.org . I went to the Folke Peterson Wildlife Rehabilitation Centers event this past Saturday. It was called the “Call of the Wild”. I gave the Purple Martin Conservation Associations PowerPoint presentation on Purple Martins. Well, I did AFTER they finally got the computer working! I had to go without ANY slides or pictures for the first 15 minutes or so, after having to start about 15 minutes late due to the technical issues. It started out with a big crowd but the computer issues discouraged some and I ended up with a small but inquisitive group that seemed genuinely interested…or too embarrassed to get up and go!!! Either way, we had a great time and I still hope that the Folke Peterson Wildlife Center will someday get to put up Purple Martin Housing. So much stuff going on I have had NO time to go visit Joe, my purple martin friend. Some of you have read about him in past Blog entries. I have to admit I have neglected him miserably. I promise that I will visit him soon and update you ASAP. Search for Jose in the search box to the right to read past entries on Joe. I grew up next to a Dog Track as a kid. Back then it was a off limits to minors. In the summer they would have a week when all the kids could come and they would get free hot dogs and soda. It was great. I remember the feeling of excitement as “speedy” the rabbit was coming around the bend towards the start box. Then the crowd would fall silent and the announcer would pause…then he would holler, “AND THEY’RE OFF!!!! !” and the crowd of kids would erupt in cheers. As soon as I woke up this morning, I did what I usually do. Look out the window at the gourd rack, then to the electrical pole on the side yard. Much to my surprise a gorgeous, glorious pair of ASY Purple Martins was sitting in the favorite spot preening and fussing with their feathers. You could tell they had just had breakfast and were sitting to pretty up for the rest of the day. I was exstatic of course. I mean, I had seen my first Purple Martin on the 8th flying and calling over head but had not seen her since. Then this morning when I saw the pair I could almost hear the announcers voice in my ear…”and we’re off” It whispered. I stood outside and just looked at them and on cue the female took off and made a slow graceful swoop over me and the rack and called out once. Her little chirrup. Then landed back in the same spot, next to her friend and continued to fuss with her feathers. I sat and watched silently along with them. The male sang his sing song chatter to her, she answered back and that was all that was said. Shake, preen, scratch, shake, preen, preen, stretch. Now my family is complete. Just then I heard my 4 year crying and my husband scolding him for “sassing”. Oh well, maybe I’ll make the trip to Brazil and you guys stay here? The Martins flew off to eat some more and I went inside to the front lines. Shore leave is over for now. Certain things I just love. Like the the way a new car smells, new carpet, fresh laundry, new purple martin equipment. Yes, I know, most people don’t put bird houses on a list with clean clothes. I mean, it’s destined for the dirtiest of jobs. Bird poop in abundance, parasites, torrential rain and abuse from the elements. But still, the shiny metal and fresh plastic gourds are so clean and virginal, it seems a shame to get it all messed up. WHat am I talking about!?!? This is a hobby where your success is almost measured by the mess that you have to clean up at seasons end. The bigger the mess-the more Purple Martins you hosted. Right? Of course! We even go to the lengths of “dirtying up” a nest so it looks used. Smear a little mud here, a little dirt there, shove some old dried up pine needles in the compartment. Why heck, we have our new equipment looking like a college dorm room in no time! Well, my new Purple Martin Gourd rack is up. For those following you know the quandry I was in to broach the subject of “what I wanted for Christmas.” I didn’t know how to convince my husband that a new gourd rack was ESSENTIAL to our marital bliss. But My husband is a smart man and a good man. In the end he asked me what I wanted for the holidays and I got my new rack. So there stands my new Creative Universe rack. Taking the place of a Quad tel pole that I almost ruptured a hernia on several times. 8 plastic gourds were too much to ask of me to lift up on a telescopic pole. The pole would slide through my hands with the speed of a demon if I forgot to put gloves on. Thankfully, never jarring an egg…but still. I was tempting fate. The attempts at lifting the rack back up were a true comedy act. By the end of the heavy hoist upwards, my arms would be trembling like a dried autumn leaf rustling violently by an Arctic blast, refusing to drop to the ground. Sweat would bead off my face like an Olympic runner…not that Jamaican runner though. A runner that actually had to put some effort into it. SO what was I to do? Tell a couple of birds that, “Hay, this rack is way to heavy so get outta here!” Heck no! I kept debating adding more but sensibility kept it at the 8 gourds that faithfully tended to 8 pairs of Purple Martins. So back to my new rack. Concreted to perfection. Pulley rope wound neatly. I seem to find reasons to go out and lower it and raise it. The effortless rise, the graceful descent…oh the fluid movements. I sit and watch the rack at night on my new bird cam awaiting another day to play with it again. Can you tell how happy my husband has made me. I bask in the glow and await my birds return!